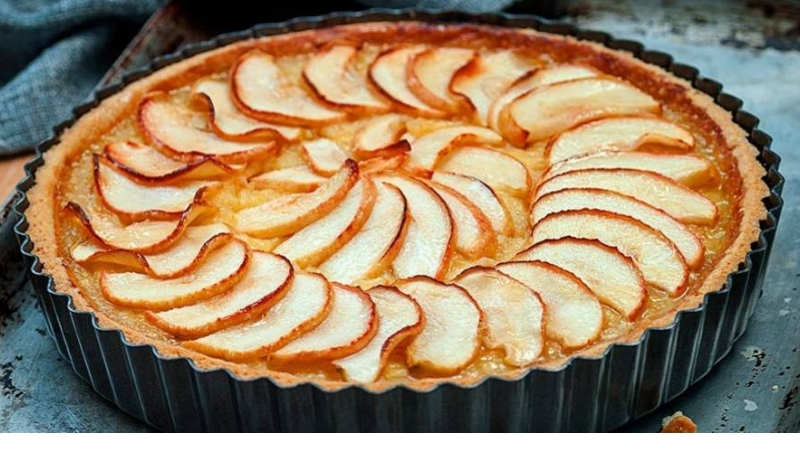 Sweet apples and zingy lemon give this tart fruity flavour, while pre-prepped pastry makes it easy! Use the pastry to line a 25cm tart tin, rolling out a little thinner if necessary. Line the pastry with baking parchment and top with dry rice or baking beans. Bake in the oven for 10 mins until the sides are set. Remove the beans, return to the oven and bake for a further 6-8 mins until evenly golden and the pastry has a sandy texture. Meanwhile, whisk together the eggs, 150g of the sugar, and the juice of 2 lemons and zest until frothy. Coarsely grate 3 of the apples and stir through the mixture. Cut the remaining apples into quarters, remove the core and thinly slice lengthways. Pour the apple and lemon mixture into the tart case and, working from the outside in, arrange the appleslices in a circular fan. Bake on the middle shelf of the oven for 50 mins or until firm to the touch and evenly golden. Leave to cool slightly then cover the pastry edges with foil. Meanwhile, mix together the remaining sugar, lemon juice, zest and sugar then heat gently in a pan over a medium setting for 5 mins until syrupy. Brush the lemon glaze over the tart and grill for 2-3 mins until golden and bubbling. Cool slightly, remove the foil and take the tart out of the case. Serve immediately. – Use the paper the pastry comes in to blind bake to save on greaseproof paper. – To simplify this further, you could make it into a galette by piling the fruit into the middle and folding the edges over.